This is not the traditional recipe for Banoffee Pie. For that, you will have to go here. 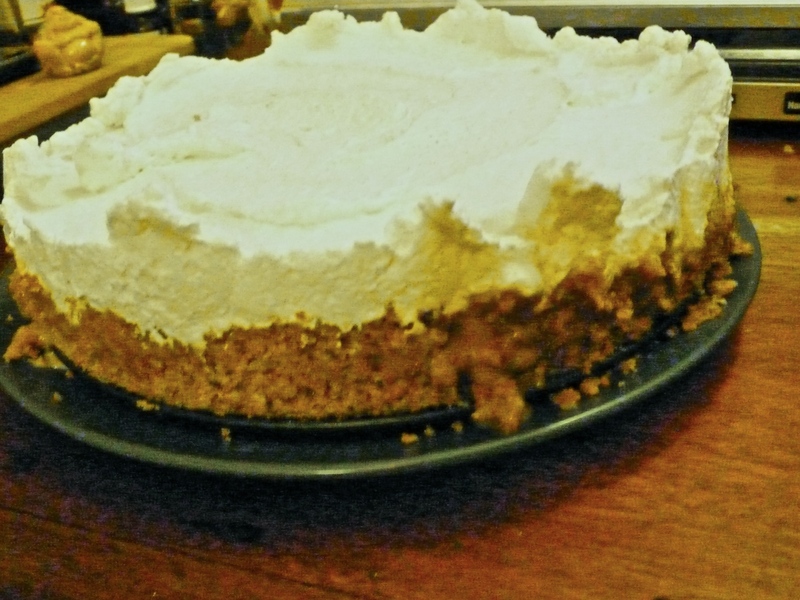 But this is the banoffee pie of my childhood. A cookie crumb crust made with HobNobs and melted butter. A thick dark golden brown slather of dulce de leche. Bananas. And a mound of unsweetened vanilla whipped cream. Each on its own, good. Combined together. Nirvana. Honestly. And its one of those desserts that you learn to make from very young, and because its so easy (given the preparedness of the ingredients), you feel a sense of achievement and satisfaction when it is served to ooohs and aaahs. Assembly is easy, and you can certainly make this divine pudding over a few days, and assemble a few hours before serving. Its really good as breakfast too. Heh. Put about 3/4 roll of HobNob cookies in a zip loc plastic bag. You should have may be 5 or 6 left (good for a cook’s tea!). Break them up a bit using your hands, and then, using any heavy object (the bottom of a wine bottle will come in handy here) smash and crush the biscuits to a fine pebbly sand. You might need to do this in two batches. Pour the crushed biscuits into an 8 inch round, non stick, springform cake pan. Pour the melted butter over, and mix. Using your fingers, create a crust at the bottom, and about half way up the sides of the pan. Put in the fridge for about 20 minutes to harden up a bit. I stabilise my whipped cream with agar agar, which is a vegetarian gelatin made from seaweed. Its totally flavourless, and about 1 tsp of agar agar to 1 cup of cream ensures the cream stays whipped and high, even after 12 hours in the fridge. together until they hold hard peaks. Set aside for the assembly. Take the crust out of the fridge, and pour in the cooled dulce de leche. It should completely coat the bottom of the crust, and be about 1/4 inch thick. If you want more, go ahead and add more, just remember it is VERY sweet. Take about 6 -9 small pisang mas bananas (or whatever is available for you), and slice lengthwise. You should get about 3 long slices from each banana. Layer the bananas over the dulce de leche. Put in the fridge for about 20 minutes to firm up again. Cover the entire pie with the unsweetened whipped cream, and refrigerate for at least 2 hours, and up to 24. When you are ready to serve, run a knife around the edges, and unmold the springform pan gently. Serve with love and gratitude. Love this, P, it’s for grown-up children! Fond memories making a version of this with very young god-daughters who were SO proud of serving it up. Agar-agar is something I must get hold of, thanks for that.